Kevin Tao Mohs’ second book, TV in the Head, is now available,published by Lucky Bat Books. In the near future, Personal Entertainment Devices (PEDs) are surgically implanted in infants soon after birth, creating a society consumed by the programs and messages being sent directly into their minds by the Personal Vision Corporation. On a hot summer’s night, an addict known as a PEDhead is murdered while breaking into the home of one of the corporation’s executives. Vision Enforcement Agent Marshal McClure is assigned to investigate the death and soon finds himself caught in the midst of a dangerous plot that threatens to take down the very institution that he’s sworn to protect. 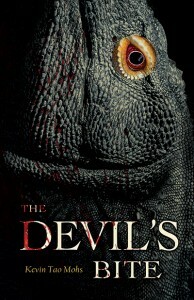 Written by Kevin Tao Mohs, producer of several nature films for television and for National Geographic, The Devil’s Bite takes us to eerie and horrifying depths. 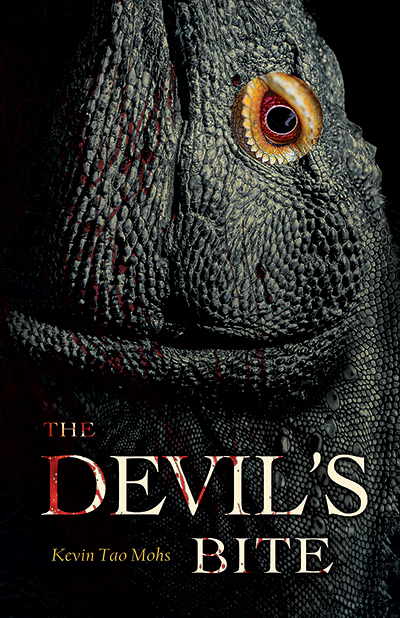 The Devil’s Bite tells the story of Josh Thomas, whose life goes downhill fast. In a matter of days, everything goes wrong. His mother dies, he loses his job and his plane crashes. Just when he thought it couldn’t get worse, he’s pursued by monstrous reptiles and bitten by a deranged stranger. As an infection courses through Josh’s body, evil impulses rise to the surface. In the searing desert, he’s fighting for his life and his very soul. Kevin Tao Mohs is a cable television executive who has worked at TLC, Animal Planet, The Discovery Channel and The National Geographic Channel in various creative capacities. His fascination with mythic creatures and the supernatural took root early in life as a young child when his father’s job brought the family from Texas to Japan to live. There he was exposed to a rich tradition of stories about ghosts, demons and monsters. His father’s profession eventually brought the family to Germany, where tales of good versus evil in the form of medieval knights battling demonic creatures came into vivid focus. His life experiences proved invaluable in his professional endeavors, especially in his work at Animal Planet as an Executive Producer on programs such as Dragons: A Fantasy Made Real, Lost Tapes and River Monsters. While at Animal Planet, he also contributed to the development of Mermaids: The Body Found. Mohs has consulted on two books for young readers (Dragons: A Fantasy Made Real and The Most Extreme – inspired from the television series he created). While at Discovery, his team oversaw such series as Deadliest Catch, Gold Rush Alaska and Mythbusters. Mohs lives in Maryland outside Washington DC with his wife, two kids and various pets. He’s hard at work on his next story. Cover of TV in the Head by Nuno Moreira. Managing Editor Michael Totten. Cover of The Devil’s Bite by Nuno Moreira. Managing Editor Judith Harlan.